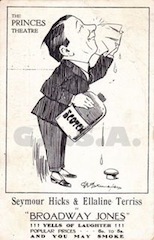 Given his obvious popularity, Bonzo was also a huge marketing tool. 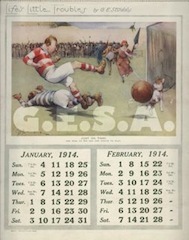 His image was used to advertise a large range of varying merchandise. 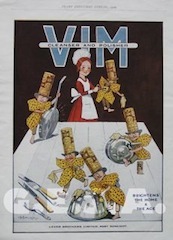 Being an established illustrator, Studdy had already created specially, or allowed the use of, images that he drew for advertising. 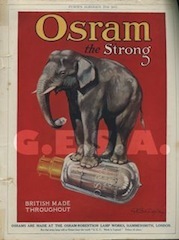 In these pages are some of the examples of Studdy's art in advertising. 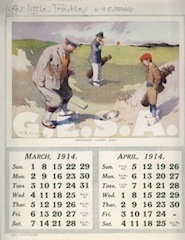 This collection of 6 images were probably taken from an eariler publication, then allowed for reuse in such advertising materials as calendars like this one published by Forman of Nottingham & inscribed for P. J. 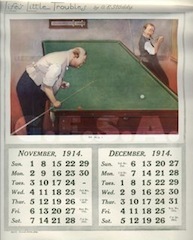 Green, a wholesale & retail tobacconist in Dunstable. 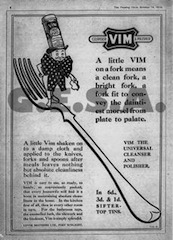 Vim scouring powder was one of the first products created by William Lever, first appeared on the market in 1904. The name is thought to derive from the colloquial English word "vim" which has the same meaning as the Latin vis, vim ("force", "vigour"). 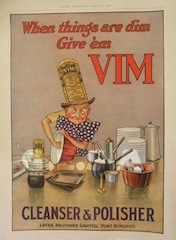 Vim was produced at Port Sunlight near Liverpool, England. 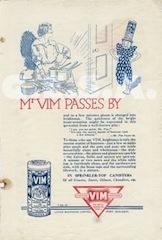 The name Vim remained solely associated with the scouring powder until 1993 when a range of associated products were released. 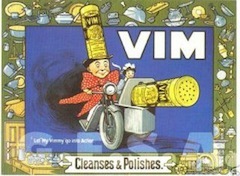 The Vim brand is currently owned by European multi-national Spotless Group. 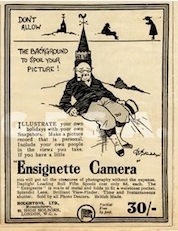 A full page colour advert appeared in the Pears' Christmas Annual of 1919 drawn & signed by Studdy, featuring a character with a distinctive tall hat. 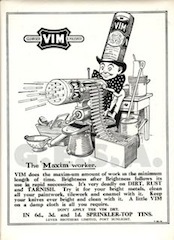 As can be seen below, this character had already appeared in a selection of Vim adverts previously. Although these are not signed, I'm fairly sure Studdy's hand was behind them. 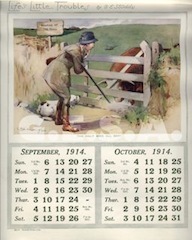 During the First World War, women filled the shortage created in the workforce when large numbers of men went to fight overseas. 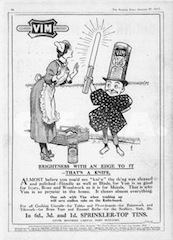 Women bus conductors employed by the London General Omnibus Company (L.G.O.C) were commonly referred to as 'clippies'. 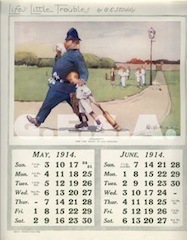 This conductor, drawn by Studdy, is thought to be standing on the rear platform of a B-type bus. 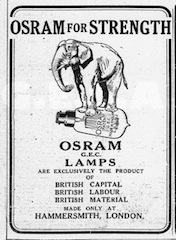 The Osram-Robertson Lamp Works Company of Hammersmith, London had at least two adverts done for them by Studdy, both using an elephant to emphasise their "strength". 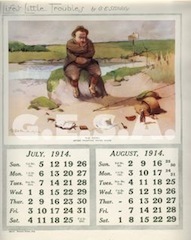 Studdy enjoyed the London theatre scene greatly, as can be seen by his many contributions to The Passing Show magazine illustrating the weekly show critiques. 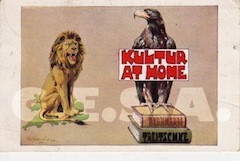 He also drew these two advertising cartoons for publicity postcards. 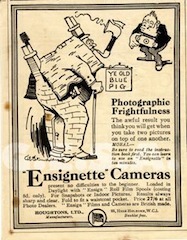 The Ensignette was one of the very characteristic camera types of Houghtons Ltd., London. 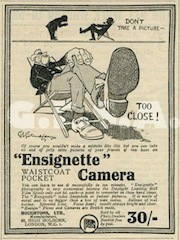 The strut folding roll-film camera of Houghton's "Ensign – British made" brand was an ingenious construction, a real vest pocket item when folded. 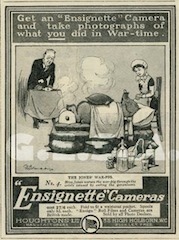 The Swedish engineer Magnus Neill had designed this first British all-metal camera of which many thousands were made. 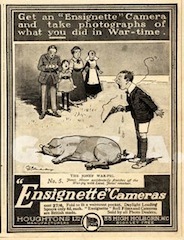 The camera was launched before Christmas 1909, and was distributed all over the world. 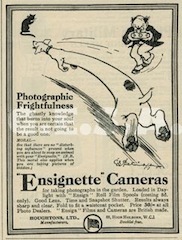 The Ensignette was a milestone in popular photography, providing for the first time a practical, truly compact camera at an affordable price to the average man. 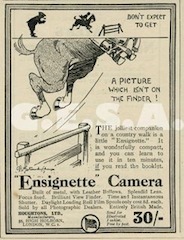 It was immensely popular, its appearance being timed perfectly to fill the need for a compact pocketable camera. 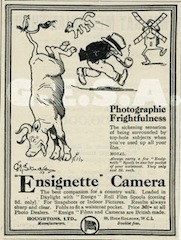 It helped create a new type of photographer the 'Pocket Snap Shooter'. 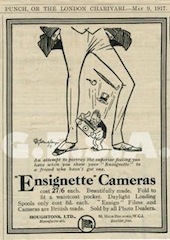 The camera was designed like a luxurious cigarette metal case, with bellows made of very thin leather. 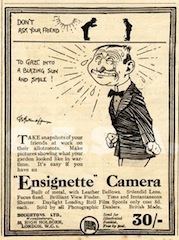 The common feature being the use of struts on all Ensignette cameras. 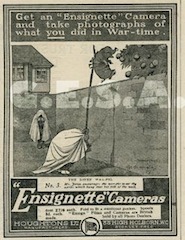 Studdy did two series of adverts for "Ensignette" cameras in 1917, the first series was a WW1 themed series, the second featured more general comic situations.